Link: xplorer� lite: free windows explorer replacement (file manager). Are you still using Windows Explorer to manage your files? If so, check out this free utility, Xplorer, which adds substantial functionality to the File management task on your Windows computer. The Lite version is free, and the Pro version, (with enhanced features) is only $30. If you have always wanted more features for file manipulation, you need to try this out. Of course, it is Futurelawyer recommended, and FREE. Link: ProDoc Small Office Suite (SOS) Practice Management System. I have been living with the Billing features of ProDoc Small Office Suite for a month now, and, although it doesn't yet integrate with Amicus Attorney, it has greatly simplified my time and billing. I don't need a full accounting solution, as my solo practice is ably handled by my accountant. I hate accounting anyway. SOS keeps track of my time and billing, and I am transferring my trust accounting to it as well. While ProDoc is designed for Florida and Texas lawyers, with form sets for automated drafting, SOS would work for any small law office, and is especially well suited to solo practitioners. While I do my calendaring, contact management and case management in Amicus, SOS will also function well in those areas. It is simple to set up and use, and I think I am hooked. Link: Google Code - Google's Developer Network. Do you fancy yourself a programmer? Do you want to create Web 2.0 applications for your specific law practice needs, or for other lawyers? Then, Google Code page is for you. This beta will be allowing home brew developers to use Google's tools to create mash-ups on the fly. Just as the Web has made content publishers of us all, the future Web will allow us to create our own applications. Brave new world. Visual Strategist - Free Mind Maps! Link: Downloads. Kyle McFarlin, at Visual Strategist, has published his Strategic Management Core MindMap, as well as the Visual Strategist Solution maps, and they are free for the download. They are a great place to start in learning the MindMap process, and will expand your thinking about your life and your law practice. You need MindManager software, and the Gyronix ResultsManager add-on, in order to take advantage of Kyle's work. If you don't want to buy MindManager yet, Kyle has provided a link to the free MindManager viewer. Thanks, Kyle. Link: Palm, Inc. - Products - Foleo. Well, the cat is out of the bag, and the new product that Palm announced today, available this summer, is the Foleo, a mobile companion to the Treo, which provides a 10 inch screen and full keyboard, connecting to the Treo via BlueTooth. 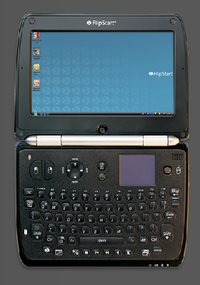 So, if you don't want to carry a notebook, this will access the information on the Treo, and permit full document editing and web browsing and email on a larger screen and keyboard. It isn't a UMPC, but only costs $499. The question is, will Treo users really want one? Too early to tell, but it IS really slim and cool looking. FlipStart - I Really Wanted to Love It! I really, really wanted to LOVE the FlipStart. What’s not to love? This 4 ½ by 6 inch little marvel runs Windows XP, and has a 30 Gigabyte Hard Drive. XP software runs great, and it loads more quickly than my Dell Notebook, even though it has a diminutive 1.1 Ghz Pentium M processor. The FlipStart has innovative new ideas, such as the tiny external display that provides access to calendar, contacts and to do list information on a 1.9 inch screen visible when the unit is closed. Which brings me to another great feature of this powerhouse little computer; it uses a clam shell design that closes over the 5.6 inch screen, protecting it from scratches and such. This feature makes it stand alone in the marketplace for handheld PCs. However, truth be told, I can only LIKE the FlipStart, primarily because I can’t find a place for it in my computing life. I wanted to like it so much that it would replace my trusty Dell D620 notebook computer, and my magical Treo 700p smartphone. It occupies a new middle ground between smartphones and PDAs on the one hand, and ultramobile or notebook computers on the other. It is small, AND it runs full versions of Windows and Linux operating systems, with roomy (proportionately) hard drives. 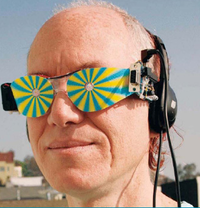 Link: Brain Machine legally induces mind trip - Engadget. Do you need to focus prior to trial? Are you wondering how to prepare for that tough closing argument? Meet the brain machine, which will not only make people stop in their tracks when they see you , but will give you flashbacks as it sends blinking lights and concentrating sounds directly to your brain. No matter what Chuck Newton tells you, though, this is not a photo of the FutureLawyer at the beach. Link: The SMS M500 GSM Watchfone: the 58 year wait is over - Engadget. The WatchPhone is finally here. This cool looking watch is a BlueTooth enabled cell phone, with quad-band GSM and 128 Megabytes of storage. If you fly to Hong Kong tonight, you can buy one tomorrow. 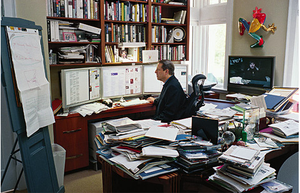 Link: Workspace: Al Gore rocks multiple monitors, could stand an inbox - Lifehacker. And what kind of monitor setup would the Inventor of the Internet use? Why a multiple monitor setup, of course. Mr. Gore could probably use a scanner, though, don't you think? Link: Open Source Alternative - Find Open Source Alternatives to commercial software. Want to join the open source movement? Tired of paying large sums of money for commercial software? Check out OSalt.com, which lists commercial software packages, and their open source alternatives. It is an open source website for open source software. Check out the free alternatives to wallet draining software.